I'd like to let you know that we are moving to www.justwritefood.com. A for-real address for a for-real blog. Please join us at our new locale, which is in the final stages of development (you get a sneak peek)! No more fresh posts here, everything will be updated at our new home. I hope to see you there. It's been unofficial for a while. Like the few years of dreaming in Portland, when I didn't quite know how the farm would fall into place. Then I met N in Boston, and we formed a shared vision for our farm while also acting superbly academic through two very-hard-to-sit-behind-a-desk years of grad school in Boston. Ick, Boston. There is only so much farming to be done in Boston, so we created an academic project allowing us to work with farmers on business planning and development for more hands on experience. Cheese in Vermont. Rabbits in North Carolina. Cost-share for irrigation development on leased land in Wisconsin. Then graduation and back to the real world, kerplunk in Madison, Wisconsin. Somehow one step closer to farming, but still not actually that much closer. I've been pondering this lately. The idea that we both possess foundational skills for starting a farm: growing vegetables, small business development, finding markets, goats, chickens and a wee bit of dairy to name a few. We are smart and hardworking and overwhelmingly stubborn. We even earned actual degrees, from which we can cite you the ins-and-outs of every United State Department of Agriculture acronym related to starting a farm: EQIP, NRCS, NIFA, FSA, BFRDP, CAFO, CRP, NPDED (ok, that one is EPA) and on and on and on. And despite the fact that we know all the steps and all the hoops we have to jump through to get there...the farm still seems far away. Yes, I know. Secretary Vilsack called for 100,000 new farmers. The 2008 Farm Bill appropriated $75 million dollars of funds for Begnning Farmer and Rancher Development Programs to provide education and training to get new farmers started. And of course, we have Know Your Farmer, Know Your Food and inspiring advocates like USDA Deputy Secretary Kathleen Merrigan leading this movement to get more people farming. Not to mention the growing market and awareness surrounding local foods. 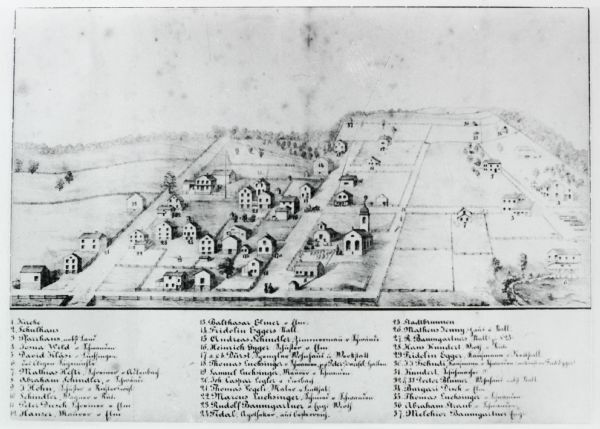 And yet, to be actually in it, planning a farm as a born-and-bred city kid without ties to the land (more specifically a specific piece of land), it feels so so so far away. Creating all these funding opportunities and support systems doesn't just magically create new farmers...it still takes lots and lots and lots of work on the part of the aspiring farmer. Please do not get me wrong. I am so grateful that new farmer programs are a priority. I am thrilled to be enrolled in the Wisconsin School for Beginning Dairy and Livestock Farmers, and working my way to a business plan, community ties and as much experience as I can gain in raising animals on pasture in this home that is still new to me. But the leap from learning and planning to actually farming feels so far away because we don't have land. However, that changed a bit today as we hopped in the car for a much-needed day of fun and adventure. The plan: visit New Glarus Brewing, enjoy some cross country skiing in the fresh snow and just explore some new territory southwest of Madison. Wisconsin's landscape is still new to me, usually inspiring constant awe, and today was no exception. I didn't know what to expect, but found promise in New Glarus' title (the city, not the brewery) as "America's Little Switzerland". Replica Swiss-style village, bakery, meat shop and all...count me in. In short, as we drove the county roads and admired the freshly-snow covered landscape past Fitchburg, we sort of fell in love. Yup, kind of head-over-heals in love. The rolling hills, the beautiful and out-of-our-price-range farmsteads, a sense of 'rural' I haven't yet seen here. (Yes, ok, I realize the snow was covering vast acres of corn and soy fields, and provided sufficient pretense to imagine instead lush pastures underneath. But let a girl dream for a few minutes). For some reason I liked this area, we both liked this area. It felt like the best parts of Vermont mingling right here with the highlights of Wisconsin. We've decided to tell every person we run into that we're looking for farm land, preferably with a house, barn and other structures. And yes, because we'd like to start a farm. This makes us look like starry-eyed crazy women to a lot of folks, but that's fine with me. I just thank goodness for those who actually take us seriously and offer sincere advice. This includes the woman who was looking forward to when we'd get married and share our passion for farming with our husbands. I take their land and farming suggestions with a double meaning. Here is information about land that may help you. I am telling you this because I believe you might actually be able to farm, and I support that. These are the good people. Today we ran into lots of the good people. The owner of The Cottage Goddess shared the basic landscape of real estate in the area, recommended agencies to work with based on her land purchase experience and provided inside scoop on an upcoming auction. We felt a wee bit, well, excited. She even suggested a visit to the Paoli Bread and Brat Haus to learn about their tiny baking enterprise and relationships with local millers and growers. And Cherri at the Haus was just as helpful as she served us free cookies (January was free cookie month), showed us her facility (including the tiny "EZ Bake Oven"), shared the story of her space (the original town mill) and how she got there (an inspired idea on a bare bones budget). And more stories about land, where to find it and where to plant ourselves. Thank you world for showing us people successfully pursuing food passion and how to make it work! Our mid-day activities were buoyed by such positive real estate and farming encounters. A fun hour or so at the brewery, which looked oddly like a Disney McMansion rendition of a Swiss chalet with the cleanest and most modern brewing quarters I have ever seen. There were tastes of Wisconsin Belgian Red with hints of cough syrup and sparkling cider (sorry) and the seasonal Golden Ale that tasted "like insect repellent" (sorry again). There was beautiful, sunny, exhausting skiing at New Glarus Woods State Park which reminds me how grateful I am to apply sunscreen in January. Also cookies, prairie and lots of cute cows. Nothing to complain about in there. A good day indeed, and a sufficient kick-in-the-pants to officially (as in actively and intentionally) look for land on which we can raise delicious and savory food and run a small business (which is, don't forget, what a farm is). And so today it starts - with orienting ourselves to the real estate world of brokers and bankers while sending out good energy to find that little piece of soil to call our own. Do you peruse the newsletter delivered with your weekly CSA share or subscribe to the e-mail list of your favorite farmers at your local market? I do, and I savor them. So many of my friends and family also love the stories their farmers share...it seemed like a good time to share these stories more widely. And the added bonus is a focus on the wonderful folks who produce the food we enjoy, all with a literary lens. At Pens to Pastures: Fodder from the Field we celebrate the agricultural life, the hard work of farmers and the grace and openness with which they share it all through writing. Dig in, enjoy and be sure to share the writings of your farmers by sending an e-mail here. Ok, ok. 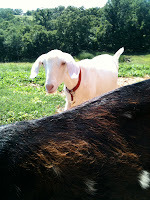 I admit that this week's Pens to Pasture post is totally cheating. As regular readers know, Dreamfarm is where I spent my first months in Madison, lending a hand to Diana's amazing cheesemaking skills, helping with animal chores and forking a lot of manure out of the barn. As the calendar ticks on to mid-January, it's been months since I've visited Diana and her family, the pregnant goats, the remaining chickens or the now-bare apple trees we harvested for cider. To say the least, I am farmsick! I miss the people, animals, sights and even smells of this particular farm. Dreamfarm is a beautiful (truly, a dream farm) family farm about 15 miles west of Madison run by Diana Murphy and her wonderful family. Primarily, Diana raises dairy goats to produce a few varieties of exceptionally delicious cheeses that are sold through a CSA, one farmers' market and a few retail outlets. As if raising goats and making farmstead cheese doesn't make for a full day, the farm also includes a wonderful cast of characters like the pastured hogs, heritage Jacob Sheep, the new Nigerian Dwarf goats, a few steer on their own pasture, a few hundred laying hens, dogs and cats. To say the least, the season I spent there was by far my favorite farming season ever! This fall we created a Dreamfarm Blog to serve as an online weekly newsletter for CSA members, and we even got around to posting a few pieces. Well, to comfort my farmsick heart, I just had to tage a gander at the blog to revisit some warm memories, and figured there is no better time to share. The last CSA newsletter was all the way back in October, but sets a nice stage for the stillness of winter (sans snow, as we don't have any on the ground here yet!). Below is a tiny blurb from the last newsletter, just click your way along to find the rest. It's hard to believe it's the end of the season, but the evidence is all around! Milk production is slowing dramatically as the goats enter the breeding season. Although there is less milk, it is higher in protein and butterfat and yields more cheese than in the summer. Love is in the air as the bucks and does mingle in the two pastures. The chickens are laying fewer eggs, and getting quirkier by the day. The trees are approaching bare, the days are noticeably shorter and the pigs are almost fat enough to eat. The end of cheese making season approaches at Dreamfarm, and we'd like to extend our enormous gratitute to you for another year of your support. Thank you! I just watched the largest V of geese I have ever seen fly overhead. A moment of peace as the skein drifted through the airspace, individuals knitting themselves amongst each other, forward and backward, over and under, left and then right. Such a vast expanse of geese, my everything required me to stop on the sidewalk and look up. Those fleeting moments that make time stand still, remind you to breathe and put everything into perspective. For a moment I considered counting the geese, but found restraint. This was the kind of occasion that only improves with time as the number of birds gets bigger, bigger and bigger upon looking back. I was the weirdo paused on the walkway, peering at the sky (mouth closed). There is such a beauty in these flying formations. We recognize them as a V, but truly the shape of the flying gaggle is constantly changing, morphing as front moves to back and so forth. And then there is the sound, the completely recognizable and awkward squawk from overhead. Absolutely in sync with nothing. Geese take me back to the first autumn I spent in the fields at Sauvie Island Organics in Portland, Oregon. The little island is a goose haven, a food-rich stop on the Pacific Flyway. Not snowy, not frozen, just wet and lush and temperate and an excellent place to visit. Except for the hunters, but that's another story. As the days shortened, the temperature cooled and the rain persisted, the geese began to pass overhead in bigger and bigger, louder and louder Vs, providing a moment to pause and imagine myself on this tiny island dot. Just a pushpin on the map of their migratory journey. I love revisiting that place, where my own internal seasonal clock began to tune with that of the geese, the sunlight, the root crops. The flying enjoyment passed, their formation fading in the cloud-brushed blue sky. My head still tilted up gazing at the emptiness, I waved them a silent goodbye. Right then, a smaller formation took me by surprise, a handful of geese flapping their way in zigzags to catch up with friends. There is joy, and there is always more joy. I never saw anything like this, but here's some Sauvie Island goose footage. Well friends, 2011 seemed to just fly by, no? Over here 2011 included starting this blog, finishing grad school, moving to Madison, starting two new jobs and setting down roots. The last two weeks were a flurry all their own with family festivities in the warm south and more carousing with the good folks in the rural parts of (slightly colder) southern Wisconsin. Cooking, eating, storytelling, trouble-making, indulging, more eating, a bit of drinking, more eating and a few too many m&m's (it's a long story) filled most of my time. And now we're all tucked in back to our cozy, hidden home in Madison and I'm ready for a sweet little exhale. So it's out with 2011, out with hurry-scurry, out with the handful of parsnips in the fridge that didn't make the haul and it's hello to the dark, cozy, slow months of the beginning of this new year and the half-pint of duck fat in the freezer. "It is great and hopeful, this tradition of turning over a new leaf. We've got a few resolutions for 2012 that we hope will stick: We promise to enjoy life more, to simplify, and to feed our minds as well as our bodies." I am not a resolution type of person. I did not resolve to eat less (who would do that), exercise more (i like my dog walks and bike rides), call my mom more often or any of that. [Although I figure it's best to cut down on the butter in the next few weeks, but that's a different story.] However, I do like goals, and last night after unpacking our week-and-a-half haul of luggage (the skis we packed hoping for snow), gifts (smartwools, lavender and stationery! ), leftovers (stinky cheese and the whatnot mom wants to get rid of), dirty laundry (self-explanatory) and dog supplies (also self-explanatory) we set to making a very short and spontaneous list. Lofty goals they may be, but I like them. N set the goal of selling a loaf of her bread. Mine is to complete a business plan and begin building equity in a herd, somehow. Our together we're aiming at renting a U-haul (the third time in a year and a half)...which means a move to the farm. Yup, the totally yet-to-be-discovered and yet-to-be-located farm. That's a good start to the year, and I have no problem aiming high. Beyond the oh-so-official sounding goals above, I'll get back to posting an episode of Pens to Pasture: Fodder from the Field each Monday. If you love the e-mails, blog, website or newsletter of your farmers, please share them with me at here. I'm still muddling along at sprucing up the blog, which is a fun adventure, and there's more to come on that in February! I've also created a Facebook page for Just Write Food, which you can visit here. I dare you to visit the page and "Like" it, and then you can get the short-attention-span version of the blog and food news galore. May you have a wonderful and bright start to your 2012! I send you warm wishes for hearty meals, adventures finding your favorite ingredients and the best weather for growing your favorite crops. Cheers! Do you peruse the newsletter delivered with your weekly CSA share or subscribe to the e-mail list of your favorite farmers at your local market? I do, and I savor them. So many of my friends and family also love the stories their farmers share...it seemed like a good time to share these stories more widely. Farming provides abundant fodder for writing and consumers provide a natural audience...and hence the perfect environment for brief, well-articulated pieces highlighting the thoughts and daily life of farmers. 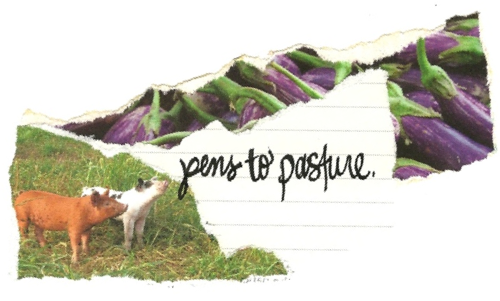 At Pens to Pastures: Fodder from the Field we celebrate the agricultural life, the hard work of farmers and the grace and openness with which they share it all through writing. Dig in, enjoy and be sure to share the writings of your farmers by sending an e-mail here. Not one, but two kind folks suggested The Ladybug Letter as the weekly fodder for Pens to Pasture. Only in California can a farmer celebrate the holiday season with a prickly pear cactus tree and a delicious recipe for its fruit. The Ladybug Letter is an "open letter from Mariquita Farm to everyone with a curiosity about the people, practices, and politics of farming" shared with readers through a blog and broadcast way beyond the bounds of their (separate) weekly newsletter to CSA members. Just one glance and I was hooked. Beyond the meltingly beautiful and smooth writing of the Ladybug Letter, Mariquita farm also prints a weekly newsletter to CSA members, all of which can also be found online as well. It must also be said that this farm offers customers an opportunity to purchase Mystery Boxes during the winter months...a clever name for a winter produce box with no specific contents listed before purchase (I love this idea)! Mariquita Farm is a small family farm near Watsonville, CA, producing CSA shares and restaurant produce for the Bay Area. Yes, we are talking about California, which means unlike the last Pens to Pasture feature from frosty Minnesota, there is no need to keep livestock water from freezing or pile too much wood for the stove (although some may be in order), but there is still a recognized respite from the peak season. And of course, the common thread of seed catalog searching, which is not overlooked here either. It's silly for me to re-post blog pieces that you can simply click to, so savor these first few words and click your way over to the Ladybug Letter for more. "Some people might say that Manzanita isn’t a very traditional choice for a Yule tree but community consensus over tradition isn’t one of our strong points here in California; Me, I like the outstretched arms of a cactus tree to hold up my string of lights."